Breathing regulates our everyday experience. What if we could change our lives by changing our breathing? 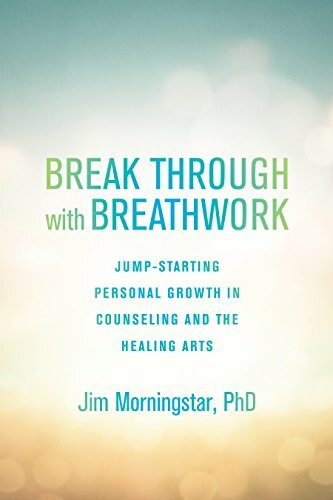 Jim Morningstar, PhD, is a pioneer in the use of breathwork as a supportive adjunct to psychotherapy. He has been a licensed clinical psychologist since 1973, and has worked in the field of breathwork throughout his career. He uses the breath to improve therapeutic outcomes and whole-health awareness. Breakthrough with Breathwork: Jump-Starting Personal Growth in the Counseling and the Healing Arts is his latest effort to promote this work. Morningstar defines breathwork as “. . . the science and art of breath awareness and breath modulation.” By re-regulating the breath in a clinical setting, one is able to release dysfunctional emotional and physiological patterns. In the research on psychological trauma, there has been significant indication that by changing breathing patterns, a clinician and client can get past heavily emotionally fortified boundaries to access and discharge deep wounds. In Break Through with Breathwork, Morningstar details both the process of applying various types of breathing techniques in a clinical setting and the research that underpins the method. While the book is detailed in its instructions, it seems that to try to implement the teachings in this book without additional training in the field would be dangerous. Morningstar agrees. Before the first chapter, he gives a page-long note to “professional therapists and practitioners of the healing arts” about the different types of breathwork and when and how they can be used. Here, too, is a warning not to use this book alone as a tool to provide breathwork consultations without further training. Morningstar writes, “We invite you to experiment and explore with the techniques in this text for yourself and connect with appropriate training centers for support in their clinical usage.” While clear, the warning about not experimenting with breathwork in a clinical setting without proper training is not worded strongly enough. Later in the text, a page is given to contraindications for the use of breathwork in a clinical setting. This section should have been more fully developed. The section focuses on the “mounting evidence” regarding the safety and efficacy of faster than normal breathing. In addition, this section should have looked much more deeply at the genuine lack of readiness many patients with a history of trauma have for either the work at hand or integrating the experiences and emotions that breathwork can bring to the surface. While breathwork can be a catalyst for tremendous healing, it must also be remembered that individuals have to be able to leave a one-hour session in a functional state and be able to maintain efficacy and stability in their lives until the next session. There are many individuals for whom this type of work is not appropriate and that was not covered as fully as it could have been in this text. Throughout the book, scope of practice concerns kept coming to mind. Is it appropriate for psychotherapists to use breathwork in their practice or as the core of their practice? It isn’t the skill that is taught in graduate school or supervised under supervision hours. In fact, Morningstar doesn’t refer to those who use the practice as psychotherapists, but as breathworkers. Does this tool fall outside the scope of practice for psychotherapists, licensed clinical social workers, and counselors? It’s certainly on the line. Appendix I addresses the issue of training standards in professional breathwork. This includes a statement on the responsibility of the breathworker and a minimum level of competence to be able to do the work professionally. It does not entirely address the scope of practice concerns one might have, but it is a start. There is enough clinical data to suggest that breathwork can be an important part of an integrated approach to healing on a number of levels. It can be an especially useful tool in the treatment of longstanding trauma. Breathwork, however, is not a panacea. It is contraindicated for many people and should only be done in a highly structured setting with trained professionals. If you are interested in learning more about breathwork and why you might want to undertake training in the field or find a qualified practitioner who uses these tools, this book is a good introduction. It is not a self-help book nor should the methods described within this book be used by those without substantial training.